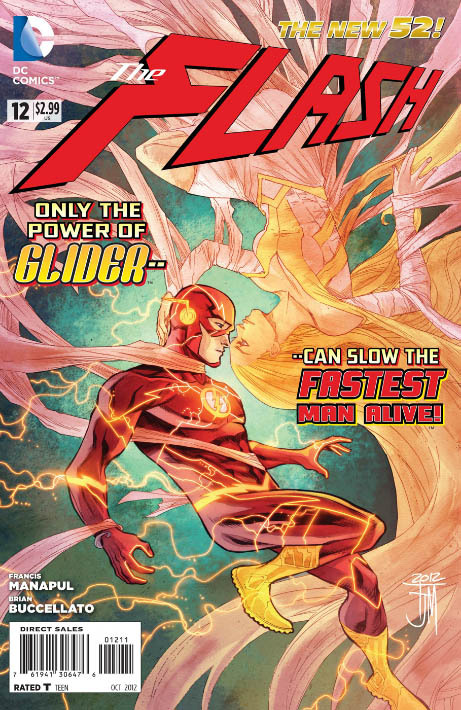 MTV Geek has a five-page preview of next week’s The Flash #12 by Francis Manapul and Brian Buccellato. Manapul is back on art this month, following a short breather. In the preview, we get a new look at (formerly Golden) Glider and more of the recently-debuted Heat Wave. Plus…Kelson! This entry was posted in Covers, Flash News and tagged Brian Buccellato, Francis Manapul, glider, Heat Wave on August 17, 2012 by Greg Elias. That is awesome! Congrats, Kelson! @SpeedForceOrg Gorgeous art. Elias is quickly becoming one of my favourite characters. That driver’s name really caught my attention, too – congrats, Kelson! Nice to see Kelson get a mention! Reminds me of the old days when Marc Andreyko & Geoff Johns would throw the names of some of the guys from the boards in their issues of Manhunter & Green Lantern. So, Brian & Francis, if you’re reading this, thanks again for making me a part of The Flash universe! 1) Very nice of them to name-drop Kelson. 2) The dialogue is horrible. 3) How is the Flash managing to STAND UP inside a car? I mean how big is that limo? I don’t think the roof is open, right? Maybe it’s a very large limo?